The Klarup Pigekor Choir was founded in 1980 and originally evolved from Klarup School Choir (founded in 1970). Today the choir is a part of Aalborg School of Culture – a school that offers teaching in music, drama and art. The small town Klarup is located close to Aalborg, which is Denmark’s fourth largest city with a population of 125.000 people, from which the choir recruits its members. Currently, the choir consists of 30 singers between the ages of 16 and 28. 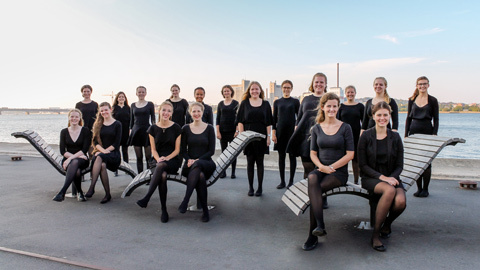 The Klarup Pigekor Choir is known for its large and varied repertoire of both secular songs and church music and is in high demand, having performed with the Aalborg Symphony Orchestra and the former Danish Radio Light Orchestra in concert radio broadcasts. The girls’ choir sings around 15 concerts every year, mainly in the northern part of Denmark. The choir’s ideals and characteristics are the pure nordic choir sound mediated through a diversity of songs. Since the choir was founded in 1980, Danish songs and classical sacred music has been its trademark. However, this does not mean that Klarup Pigekor Choir refrains from exploring other genres. On the contrary, the choir's repertoire contains a wide variety of musical styles from classical music, to folk music, to pop and other popular genres. In working with styles other than the classical, the choir always pursues the highest possible authenticity of the musical expression intended by the artist. It has become a tradition forthe choir to represent Aalborg and Denmark at festivals and competitions or on concert tours every second year, for instance on their tour to Portugal in 2016. Latest in 2016 as the choir toured in Portugal. Christina Kjærulff has been the conductor of Klarup Pigekor Choir since 2009. 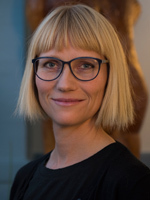 She studied music at Aalborg University and has a master’s degree in music with specialization in Music Pedagogy and Choir Conduction. Apart from directing the Klarup Pigekor Choir,Christina Kjærulff also teaches piano at the same school. Since 2012 she is also the chief conductor of another girls’ choir in the north of Jutland – Nordjysk Pigekor. Previously she has conducted various and has been a choir singer herself since the age of 8.